Manufacturers Index - Savage Manufacturing Co.
Beginning in the late 1940s, the Savage Manufacturing Co. manufactured slow-speed attachments for fractional-horsepower machine tools. In 1952 a particularly clever version was introduced that was adapted to column drill presses in the 15" to 17" size. The attachment provided continuously variable speed and speed reduction by introducing a pair of stacked Reeves-style pulleys intermediate between the drill press's two cone pulleys, and using two belts instead of one. This version was granted a patent in 1954. 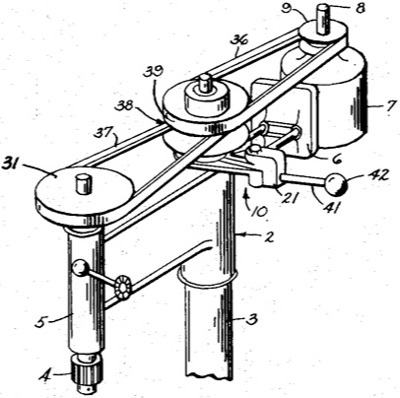 Another patent, granted the following year, was for a compact belt-driven speed reduction that attached to a motor via its base, requiring no modifications to the motor or the machine it is driving. We have not seen a surviving version of this model. Savage also manufactured a simpler low-speed mechanism for Sears Roebuck's Craftsman drill presses, which was sold as the model 9-2340 Vari-Slo attachment. Savage Manufacturing Co. was established by Hal Savage of Arizona Welding Equipment Co., who conceived the idea of a variable-speed drill press attachment. Robert D. Phares designed the attachment and was probably responsible for the day-to-day operations of the company. By the mid-to-late 1950s, the company was in financial difficulty and the business ended up in the hands of their landlord, Earl Gilbert of Gilbert Engineering Co., an up-and-coming contract manufacturer. Gilbert Engineering Co. continued making the variable-speed products into the late 1960s. Display ad in June 1949 Popular Science featuring an early version of the variable-speed pulley mechanism. This version lacks the lever to easily change speeds. "Mount it on your lathe, drill press, bandsaw, fans, blowers, shooter bikes, etc." We learned of this maker when researching a Delta drill press that has an add-on variable-speed mechanism and a tag that reads, "Gilbert Engineering Co. / Phoenix, Arizona / Vari-Slo / Pat. 2,689,484 / Speed-Juster". Searching on "Vari-Slo" and "Speed-Juster" led us to Savage Manufacturing Co., and the patent revealed that the inventor was Robert D. Phares. 1952-12-27 Arizona Republic . "Latest in machine tools is an inexpensive variable speed gadget that clips onto just about any drill press. Made in Phoenix by the Savage Manufacturing Co., 415 S. Seventh St. - the attachment, selling for less than $30, will save the home craftsman and small manufacturer time, broken drills, and a lot of exasperation. It all started five years ago, when Hal Savage, owner of Arizona Welding Equipment Co., decided to produce a new drill press with a variable speed drive. Since different size drills and different materials all require different drill press speeds, Savage...eventually produced a simpler, inexpensive model drive that could be attached to any drill press. A number were produced for various manufacturers, and improvements made as they suggested themselves. Earlier models were put in use in the company's own plant, and have more than paid for themselves in time saved changing over from one production job to another. Now the company is manufacturing a special model for Sears, Roebuck and Co., with a complete range of speeds from 300 to 3,800 rpm, and an easily read scale to show at a glance how fast it's going. Selling the drives has been simple, Phares says. One manufacturer in Phoenix didn't want any part of it though, until Phares gave him one. Shortly thereafter, Phares visited the plant, and found the workmen all using the one variable speed drill press. Following the same basic idea, Savage now is manufacturing a variable speed drive for woodworking lathes, and is developing a reduction unit for Sears..."
1967-05-14 Arizona Republic . "Earl Gilbert, founder and head of Gilbert Engineering Co., demonstrates he still can operate a tool which drills and faces parts for a California customer. ... "He can operate any machine in the shop," boasts R. E. O'Brien. One of Gilbert's earliest employees. He worked beside the president while they both manned broken-down equipment the previous owners had left over after hard times forced them to sell off machine tools one at a time. "For a long time, he had a machine tool in his office," O'Brien recalled. "When he wasn't busy at his desk, he'd go over to the equipment and machine parts." Complaining that nothing adds more glamour to the good old days than a bad old memory, Earl Gilbert modifies that bit of folklore. Earl Gilbert, standing well over 6 feet and, after careful dieting, weighing an even eighth of a ton, denies he is a self-made man. He claims he is a people-made man. "I just happened to have the good luck to be surrounded with great people employees, friends, neighbors, associates when I needed them most," Gilbert says in explaining how he built Gilbert Engineering Co. Inc., from a three-man operation to 150 in 10 hard years. This year, the firm, now occupying new quarters in 3700 N. 36th St.,' will gross (3 million in production, pay out around $1 million in wages, and do up to three times more business each month than his plant did the first year he owned it..."